UC San Diego bioengineers have developed smart, self-healing hydrogels with far-reaching applications including medial sutures, targeted drug delivery, industrial sealants and self-healing plastics. Credit: Joshua Knoff, UC San Diego Jacobs School of Engineering. 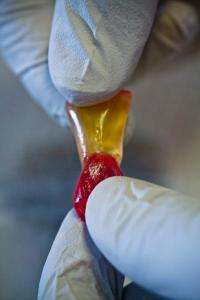 University of California, San Diego bioengineers have developed a self-healing hydrogel that binds in seconds, as easily as Velcro, and forms a bond strong enough to withstand repeated stretching. The material has numerous potential applications, including medical sutures, targeted drug delivery, industrial sealants and self-healing plastics, a team of UC San Diego Jacobs School of Engineering researchers reported March 5 in the online Early Edition of the Proceedings of the National Academy of Sciences. Hydrogels are made of linked chains of polymer molecules that form a flexible, jello-like material similar to soft-tissues. Until now, researchers have been unable to develop hydrogels that can rapidly repair themselves when a cut was introduced, limiting their potential applications. The team, led by Shyni Varghese, overcame this challenge with the use of "dangling side chain" molecules that extend like fingers on a hand from the primary structure of the hydrogel network and enable them to grasp one another. "Self-healing is one of the most fundamental properties of living tissues that allows them to sustain repeated damage," says Varghese. "Being bioengineers, one question that repeatedly appeared before us was if one could mimic self-healing in synthetic, tissue-like materials such as hydrogels. The benefits of creating such an aqueous self-healing material would be far-reaching in medicine and engineering." To design the side chain molecules of the hydrogel that would enable rapid self-healing, Varghese and her collaborators performed computer simulations of the hydrogel network. The simulations revealed that the ability of the hydrogel to self-heal depended critically on the length of the side chain molecules, or fingers, and that hydrogels having an optimal length of side chain molecules exhibited the strongest self-healing. When two cylindrical pieces of gels featuring these optimized fingers were placed together in an acidic solution, they stuck together instantly. Varghese's lab further found that by simply adjusting the solution's pH levels up or down, the pieces weld (low pH) and separate (high pH) very easily. The process was successfully repeated numerous times without any reduction in the weld strength. Ameya Phadke, a fourth year PhD student in Varghese's lab said the hydrogel's strength and flexibility in an acidic environment  similar to that of the stomach  makes it ideal as an adhesive to heal stomach perforations or for controlled drug delivery to ulcers. Such healing material could also be useful in the field of energy conservation and recycling where self-healing materials could help reduce industrial and consumer waste, according to Varghese. Additionally, the rapidity of self-healing in response to acids makes the material a promising candidate to seal leakages from containers containing corrosive acids. To test this theory, her lab cut a hole in the bottom of a plastic container, "healed" it by sealing the hole with the hydrogel and demonstrated that it prevented any leakage of acid through the hole. Moving forward, Varghese and her lab hope to test the material in its envisioned applications on a larger scale. The team also hopes to engineer other varieties of hydrogels that self-heal at different pH values, thereby extending the applications of such hydrogels beyond acidic conditions. 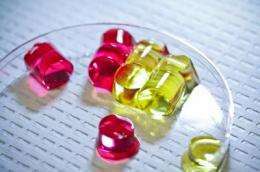 Such a gummy bears could be regenerated in original form after being eaten. I can see a potential for huge material savings here.